Rainer Heute bass sax, bass clar. Devoted to Songs by Artists Ranging From Imogen Heap to Jimmy Webb To Queen, Hollenbeck’s Arrangements Offer New Perspective on an Array of Familiar Songs. John Hollenbeck didn’t seek out popular music when he was kid, but it was always there, and it became an undeniable part of him. Songs I Like A Lot is an album on which the adventurous and internationally renowned composer, esteemed for his ability to strike upon new sounds, turns instead toward familiar forms, and weaves other peoples’ songs into his own unique tapestry. Growing up in Binghamton, New York, Hollenbeck frequently heard “Wichita Lineman,” a song originally by pop writer Jimmy Webb, as sung by one of his father’s favorite pop balladeers Glen Campbell. Although he was more interested in music that sounded new to him, Webb’s songwriting left an indelible impression. For Songs I Like A Lot, Hollenbeck scoured his memory in search of songs that had similarly become inextricable from his musical outlook. He compiled a big list, and whittled it down with help from vocalists Theo Bleckmann and Kate McGarry, who are featured on the album, along with pianist Gary Versace. 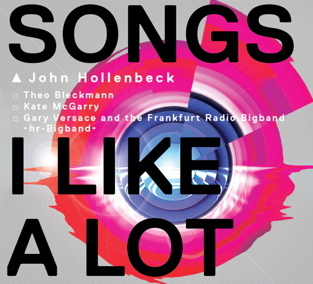 Commissioned by the Frankfurt Radio Big Band, who also recorded the album, Songs I Like A Lot became an exhibition of imaginatively remolded songs from a diverse array of musical worlds. The album contains covers of songs by Jimmy Webb, avant-garde saxophonist Ornette Coleman, the power pop band Queen, sound artists Nobukazu Takemura and Imogen Heap, and the traditional Appalachian ballad “Man of Constant Sorrow.” Broad in their stylistic range, the songs have each carved out a distinct path, and are now connected by having been cast anew with Hollenbeck’s dexterous hand. John Hollenbeck, the drummer and composer who, according to the New York Times, “inhabits a world of gleaming modernity,” has developed a career based on fusing jazz, classical minimalism, rock, and avant-garde music. He has stunned jazz audiences with his work in Claudia Quintet, and is a rising star in new music circles thanks to his collaborations with vocalist Meredith Monk, and for pieces commissioned by Bang on a Can and the People’s commissioning fund, Ethos Percussion Group funded by the Jerome Foundation, Youngstown State University, Gotham Wind Symphony, Melbourne Jazz Festival, Edinburgh Jazz Festival, and the University of Rochester. Since he began unleashing his unique and all-embracing compositional style with his first recordings in 2001, Hollenbeck has demonstrated a knack for creating original music that defies category. No matter the ensemble or the context, his music is irrepressible, bursting with infectious grooves, brilliant colors, and skewed rhythmic juxtapositions. His original compositions have put music to poetry, as in the Claudia Quintet’s What is the Beautiful?, where works by poet Kenneth Patchen are brought to life through voice and instrumentation. On Shut Up and Dance, he wrote an intricately textured and groove-driven piece for each member of France’s Orchestre National de Jazz. Despite the challenge of having to maintain the structure of the songs he arranges, Hollenbeck manages to treat each piece with his inimitable style, replete with lush and tightly dissonant chords, glimmering as a result of using woodwinds such as flutes and clarinets intermingled with brass instruments. The machine-like repetitive rhythms, inspired by the motoric pulses of minimalism, give the music a sense of unfaltering motion and direction.